Articles have been written to teach doctors the right way to say "no." (CNN) -- When singer Michael Jackson asked for the anesthetic, Diprivan, to help him get a good night's sleep, nurse practitioner Cherilyn Lee told CNN, she refused, telling the pop star that if he took the medicine, he might never wake up. Music legend Michael Jackson, who died June 25, was reprtedly told "no" by several health care providers. When Jackson asked Dr. Deepak Chopra for a narcotic, Chopra said he told Jackson absolutely no. "I said to him, 'Michael, you're going to die one day from this,'" Chopra told CNN in a recent interview. But apparently other doctors had a very hard time saying "no" to Michael Jackson. During a world tour in the mid-'90s, sources close to Jackson told CNN that the pop star suffered from insomnia and traveled with an anesthesiologist who would "take him down" at night and then "bring him back up." According to a report on a 2004 Santa Barbara police investigation, security guards in Jackson's inner circle said he traveled the country getting prescriptions from doctors. 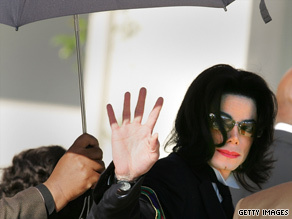 "Michael's addiction was ultimately created by doctors," Chopra said. Experts on doctor behavior said physicians often have a tough time saying no to requests from a patient -- even when the patient isn't a celebrity. "There's constant pressure to say yes to things even when it's not in the patient's best interest," said Dr. Joseph Weiner, chief of consultation psychiatry at North Shore University Hospital in Manhasset, New York. "It's become an everyday dilemma." For example, he said doctors sometimes say yes to demands for antibiotics even in cases of the common cold, or submit to demands for drugs advertised on television when that drug isn't the best choice. Sometimes, patients who are at the end of life ask for extensive tests and treatments, and doctors acquiesce even when they know death is imminent and unavoidable. The situation has become so bad that doctors have written articles suggesting ways to refuse patients' requests tactfully. "We're often unready to say no to patients when they want a particular prescription or test, even if it is unwarranted," write physicians in the Permanente Journal. The article goes on to give advice on the art of saying "no." Of course, money is sometimes a motive for appeasing patients, Weiner said. "You don't want to lose that patient. You figure if you don't do what they want, they'll go to someone else, so you don't want to say no," said Dr. Francesca Fusco, a cosmetic dermatologist in New York. But there are more than just financial forces at work. Fusco said doctors go into medicine because they want to help people, and sometimes that good instinct goes bad. "We want to make patients happy," she said. Sometimes time -- or lack of it -- is the culprit. "Doctors want to get the patient in and out in five minutes, so it's much easier to just write the prescription the patient asks for," Chopra said. Another reason doctors say yes when they really want to say no has to do with the changing nature of the doctor-patient relationship. "In the current environment in which patients are supposed to be treated like customers, there is sometimes the expectation that the customer is always right and should get whatever is asked for," said Dr. Danielle Ofri, assistant professor of medicine at New York University School of Medicine. Ofri remembers once agreeing to a patient's request for drugs -- and regretting it. The patient asked her for a high dose of oxycodone for back pain. When she hesitated, he became upset and accused her of not believing him when he said his back hurt. With misgivings, Ofri gave him the prescription. "For the rest of the day, I walked around with a terrible feeling in my stomach," Ofri said. "I really wished I'd said no." The next day, the patient knocked on her door and handed her the prescription. "I lied to you," the patient told Ofri. "I'm very sorry, and I'm not sure what came over me, but I lied and I owe you an apology." Ofri said she was "stunned, but relieved." The "just say no" problem is particularly evident in the world of cosmetic medicine, where patients often demand yet another face-lift, more Botox, or another injection of filler in their lips. Fusco said she tells her students at the Mount Sinai School of Medicine that when a patient's request is inappropriate, they need to take the time to explain why. "Ninety-five percent of the time, patients will agree with me and not push for more," she said. "The other 5 percent I won't see again, but I'd rather not see them if they're walking down the street and their lips turn the corner before they do." CNN's Sabriya Rice and Danielle Dellorto contributed to this report.